Texas may be known for mild winters and hot summers, but Austinites know it can still get pretty cold in our part of the country, too. We are certainly not immune from cold spells — but adequate preparation right now will help you stay warm at home when the weather decides to drop unexpectedly. Just like your window treatments keep out the sun and heat in the summer, Hunter Douglas shades can provide a substantial amount of insulation for your home in the winter. Have you prepared your house for the cooler temperatures? Get ready for unpredictable cold spells during December, January, and February with energy-efficient honeycomb shades in Austin. At Southern Shutters Shades and Blinds, we are happy to offer the entire selection of honeycomb shades from Hunter Douglas. The one that is right for you depends on where in your home they will be installed, as well as how much light you want coming in. We will discuss your options and help you decide which is best for you based on your window treatment preferences. Duette: The original model of honeycomb shades comes in multiple cell sizes, can have a vertical or horizontal slide, and ranges from sheer to opaque. Duette Architella: The unique honeycomb -within-a-honeycomb design keeps heat outside the home in the summer, and holds it in during the winter. This double (or triple) honeycomb option comes in a variety of colors and pleat sizes. 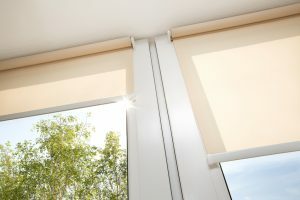 Applause: The only honeycomb shades with energy-efficient, triple-cell beside a cell construction, the Applause offers a wide selection of choice in colors, fabrics, and operating systems. How will honeycomb shades fit into your home? The Hunter Douglas designs are custom-fit to work in virtually any window. Whether it’s an arch, circle, angled window, a skylight, or other large expanse, the Hunter Douglas honeycomb shade can work beautifully. Contact Southern Shutters Shades and Blinds to discuss your specific case. We’ll help you understand how Hunter Douglas window treatments can be used in your home. When you purchase Hunter Douglas custom window treatments from Southern Shutters Shades and Blinds, you benefit from our lifetime restringing guarantee. For the first seven years, you’ll benefit from Hunter Douglas’s warranty. And we believe in their products so much that we’ll back them up for the duration of your home ownership! Get Started on Your Winter Window Treatments! If you would like to get started preparing your home for winter, please get in touch with Southern Shutters Shades and Blinds to discuss adding honeycomb shades to your windows. They provide significant insulation and protection from any unexpected cold front that may come our way this winter. Come by our showroom or get in touch with our team today!